Congratulations to the ladies intermediate side who turned in a sparkling performance to defeat Enniskillen in their semi final clash at Derrygonnelly on Saturday evening. This was a top notch team display from the squad and they had plenty in hand over the opposition at the finish, ten points to the good on a scoreboard of 4-10 to 1-9. On the goal trail for them had ben Ursula Fee, Blaithín Bogue and Catriona Breen with points supplied by Roisin McCusker among others. In a sound defence which offered up little scope to the Enniskillen attack there were to be especially strong contributions from Cliona Bogue , Kayleigh Bradley West with Anna Kennedy also to the fore. Final opponents will be Derrygonnelly, a formidable side, but this fine win for the team over Enniskillen will have them in buoyant mood for the upcoming decider which is scheduled for the coming weekend. At the time of writing these notes no firm details are available . Not such a good story as far as the senior men are concerned as they bowed out of their quest for the New York Gold Cup when they lost out to Erne Gaels in their replay quarter final at Kinawley on Saturday evening. Not an encouraging opening half from the side as Erne Gaels looked the sharper and there was a four points deficit to be faced on the resumption but in the early stages on the turnover the team put in a fine spell and a goal went a long way to haul them back into contention. All to no avail however as the run to the finish was dictated by the Belleek side who shot a number of unanswered points to win by five. Next game for the team is a clash with Teemore as the bid to avoid championship relegation gets underway. 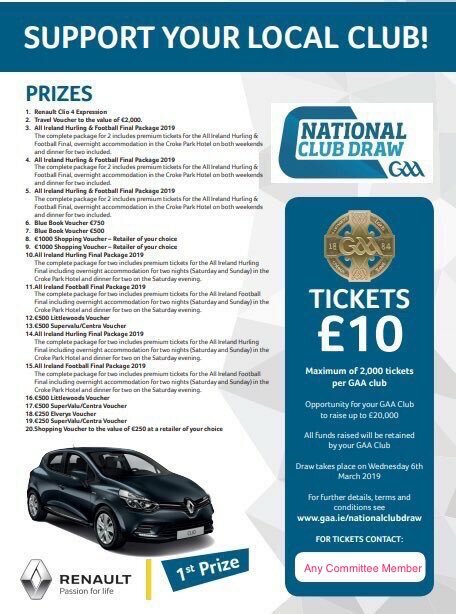 Jackpot for this weekend now stands at £3 000 and the team on duty is Eamon Fee, Declan Connolly and Paul McCann. Team on duty for Saturdays September 15th and 22nd is Shane Breen, Marius Kerr and Conor Meehan. come along and support the lads tonight. 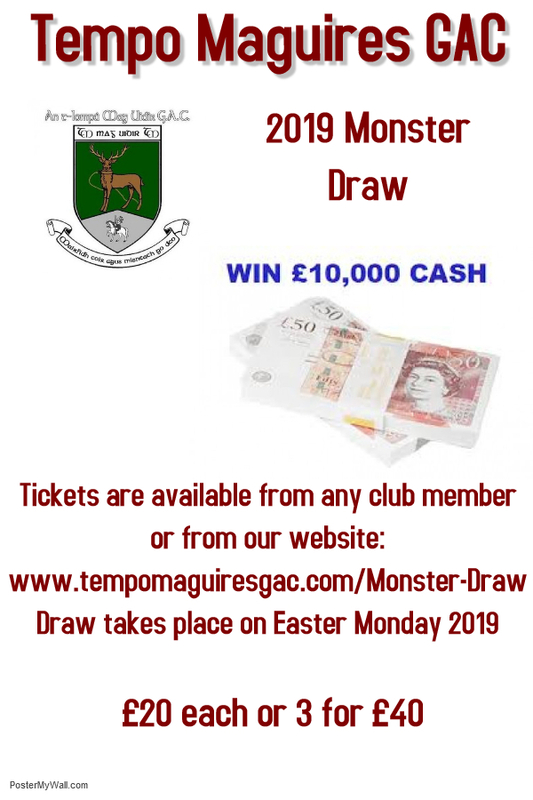 Further progress for the minor team as they reversed their only setback of the league campaign with a three point away victory over Lisnaskea. The first clash between the sides had seen the Emmett’s edge out a win but Tempo were in a determined mood to reverse that result. Still it was to be a tight affair the teams level at the break and ‘Skea creeping ahead on the restart. However this was a game which was to see goals as the decisive factors and Tempo notched two,first up being a penalty calmly slotted home by Conor Magee in the first half and Matthew Kerr was to plant home the second to push the side two points clear on forty minutes. In a well balanced final quarter Tempo who had strong defensive contributions from full back Ruairi Moore and centre back Aiden Flanagan did enough to hang on for fine win on a scoreline of 2-5 to 0-11. Next fixture is a meeting with Erne Gaels. The scheduled under 13 game on Saturday with Teemore was postponed due to a hurling blitz elsewhere in the county. 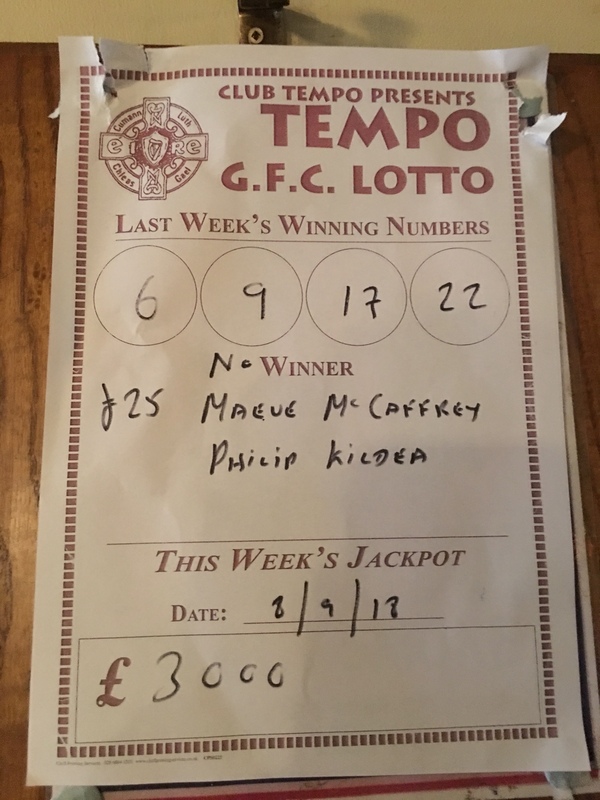 Lotto jackpot for last weekend was not won the numbers drawn being 5 9 15 and 26. Winners of the two £25 prizes were Niccola Elliott and Mary McKernan. Jackpot for next weekend now stands at £2 900. Team on duty for Saturdays September 1st and 8th is Eamon Fee, Declan Connolly and Paul McCann. Team on duty for Saturdays September 15th and 22nd is Shane Breen, Marius Kerr and Conor Meehan. Key game of the coming week is the replay of the SFC tie with Erne Gaels. There should be optimism that the side can advance to the semi final where the opponents would be Ederney. A defeat would see the side face into a relegation scenario, the initial opposition here being Teemore but hopefully that won’t be the case. Games sessions continue in the Community Centre on Thursday evenings, opening game at 9-00 and admission is £10. Attendances of late have improved but club members are still encouraged to attend at least on an occasional basis. Top prize is £5 000 on game ten.